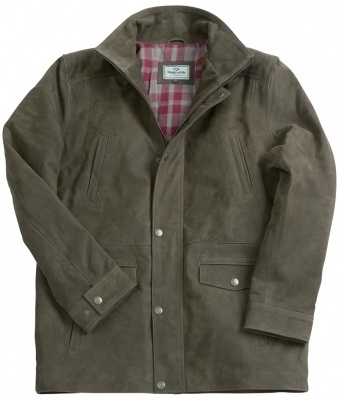 This luxurious leather coat, with its classically refined appearance, is hewn from rugged buffalo nubuck leather, to take the knocks of country life. Buffalo hide leather ages gracefully over time, and so only improves with age. Featuring a warm, checked cotton lining across the back and shoulders, and a quilted polyester lining on the lower back and sleeves, both for warmth and to slide easily on and off. Long enough to wear over a blazer or sports jacket. With six external pockets, and one internal zipped security pocket, plus reinforced adjustable cuffs.